Providing you the best range of gen-x long stem modular hip replacement system, calcar stem, muller stem and gen x modular hip replacement system with effective & timely delivery. 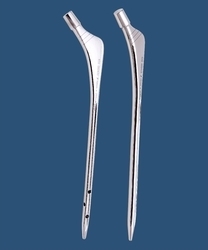 Gen-X Long Stem Modular Hip Replacement System with Locking And Without Locking material SS / Titanium. 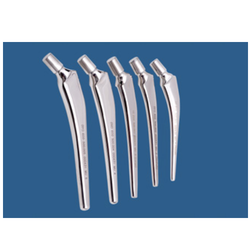 Since our inception, we are involved in manufacturing, supplying and exporting a wide array of Calcar Stem. These cups are designed and developed using quality-approved metals in complete sync with international quality standards. All the stem are made available to customers in several sizes such as 7mm, 8mm and 9mm. 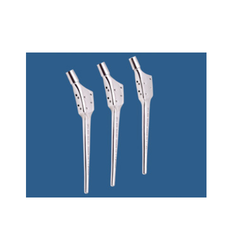 The offered range of stem is widely used in various types of hip replacement surgeries. In addition to this,Calcar Stem offered by us are checked by our quality controllers thoroughly so as to deliver only fine finish products at customers' location within the committed time-frame. Straight & bowed-stem components in different type of femoral revisions. Excellent fatigue limit ensured by bio-compatible titanium substrate. Bone loss replacement is performed through implanting femoral stem implant into the proximal femur, matched by stem size with proximal metaphyseal regions and distal stem lengths. Fitting keel on flange ensures functional stability. The better range of movement with neck and head design. Femoral offset reinstates abductor function and affects the outcome of hip replacement. Outstanding fatigue endurance limit of forged CoCr alloy. Optimal cement compression during insertion by the dual-tapered stem design. Cement fastening is improved by proximal surface texturing. Material SS and Titanium Muller Stem. Looking for Modular Hip Replacement Systems ?